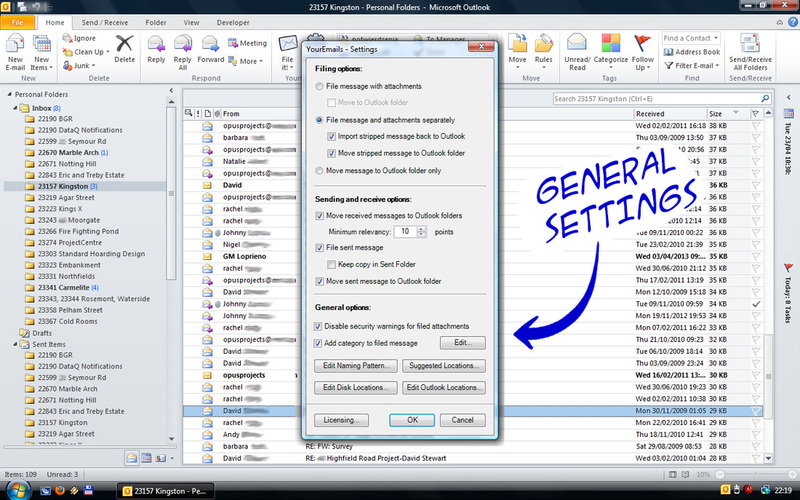 Mail Manager for filing and auto-sorting emails. 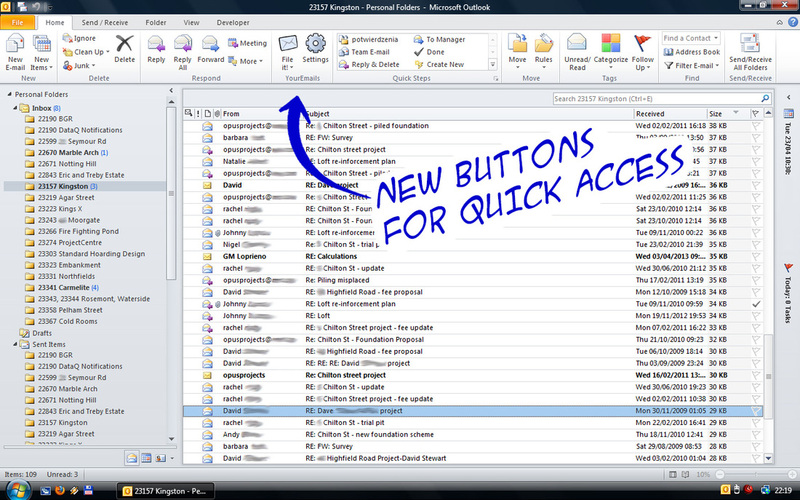 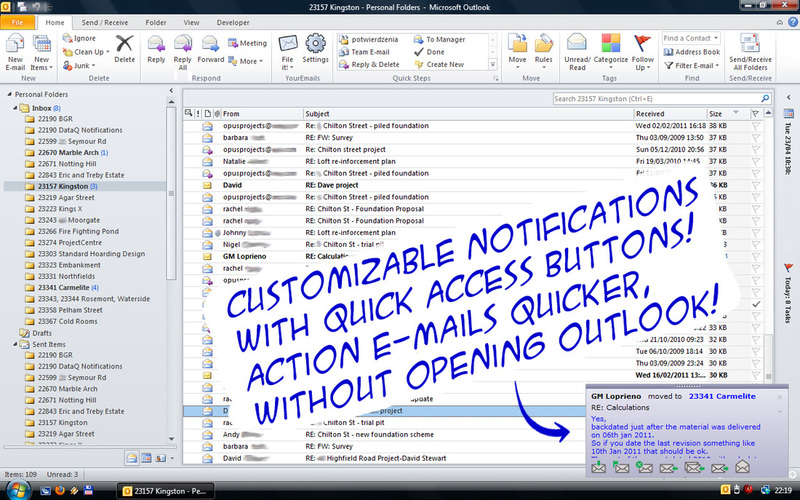 Designed to keep your Microsoft Outlook transparent, save you time and keep your Inbox size to a minimum. 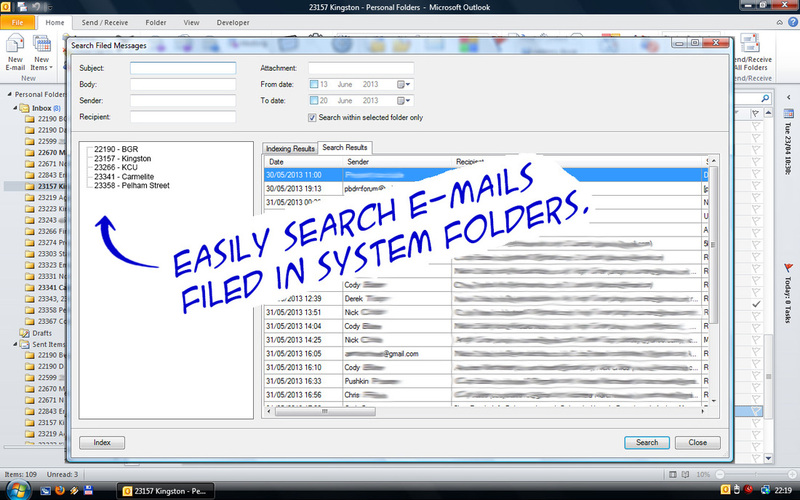 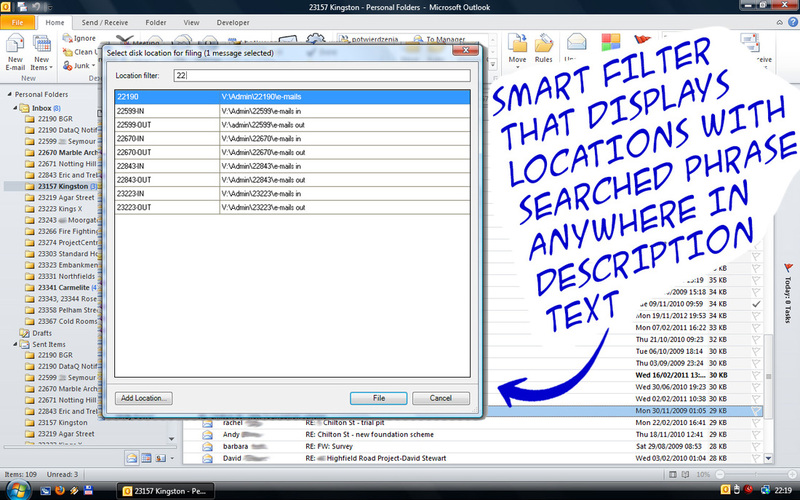 Auto-sort, file and search your sent/received e-mails on the fly. 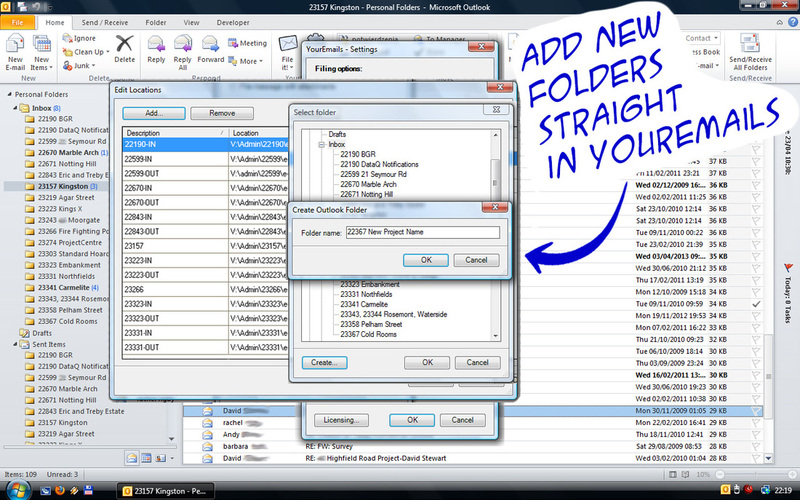 Making these easily accessible by your team. 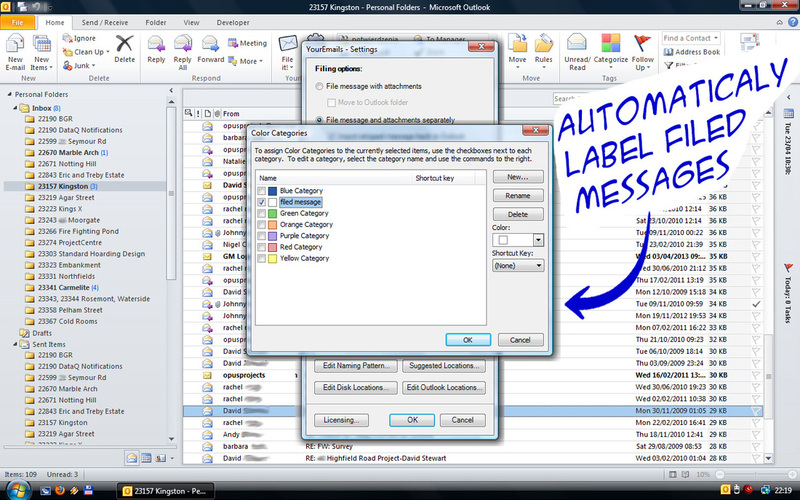 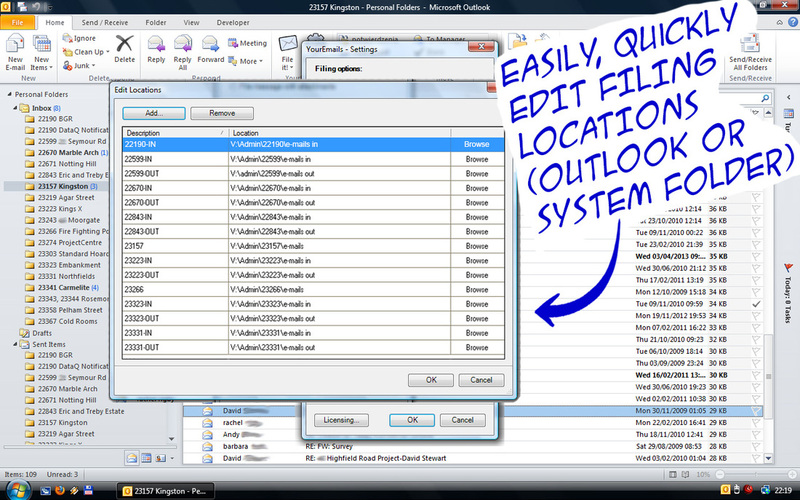 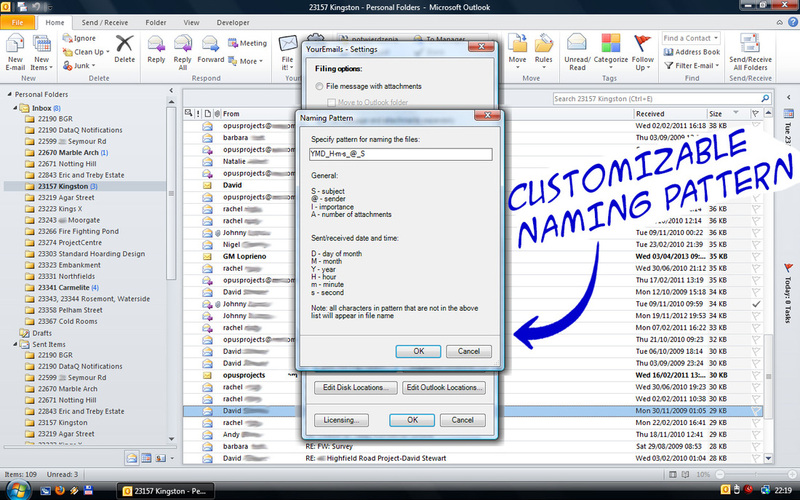 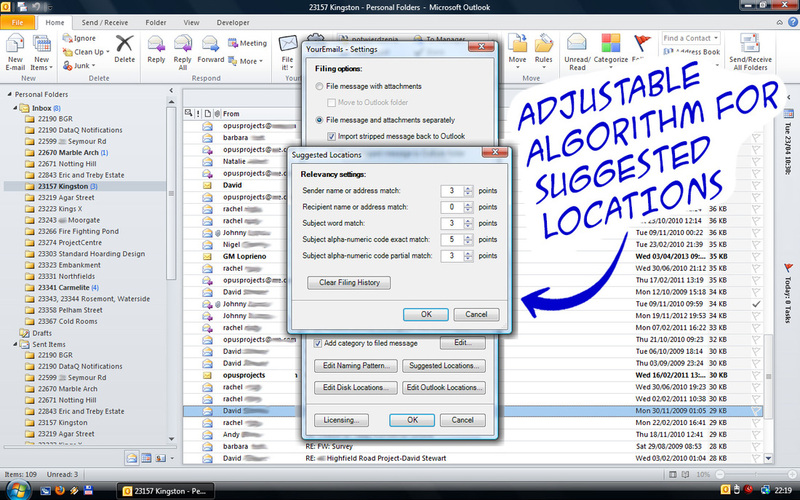 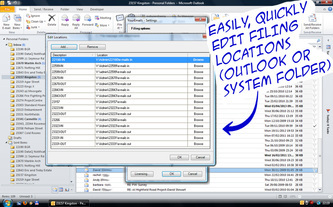 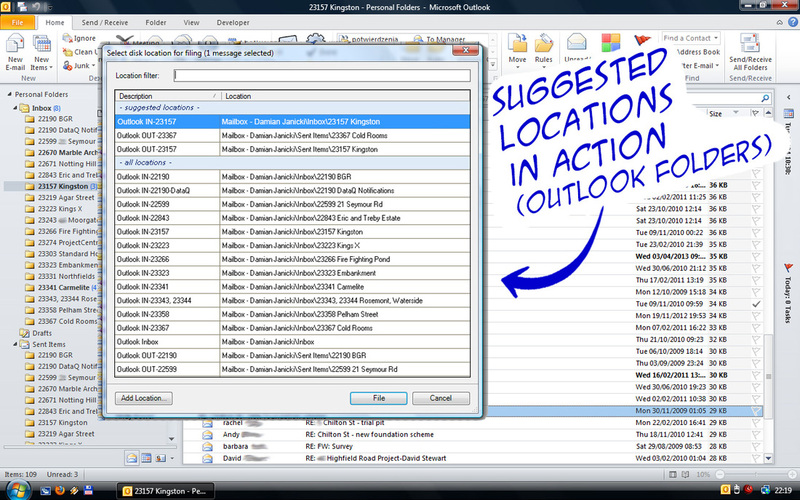 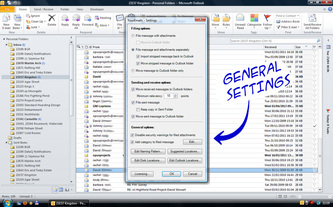 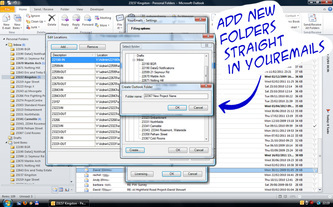 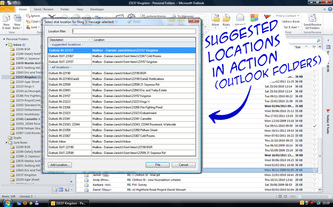 This Outlook add-in includes traditional filing methods like 'move message to Outlook folder' or 'file message in System folder' or 'file attachments separately'. 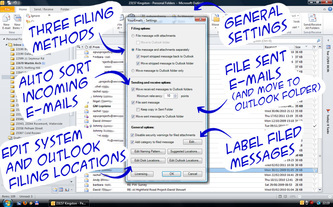 But it also includes an innovative filing method which files e-mails and attachments separately and then imports stripped messages back to Outlook folder with hyperlinks to filed attachments. 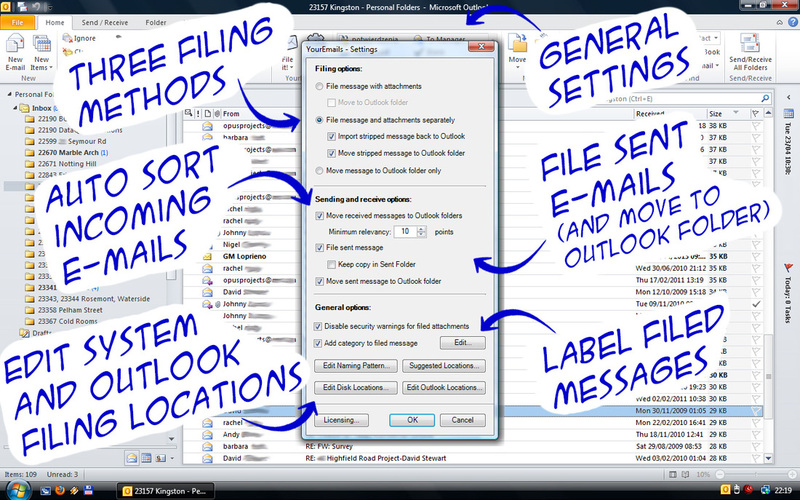 This way your Inbox size is small; e-mails are filed and so are accessible by your team; yet stripped messages are kept in your Outlook folders for easy access and searching - just as it should be! YourEmails can automatically label messages as filed for easier reference. 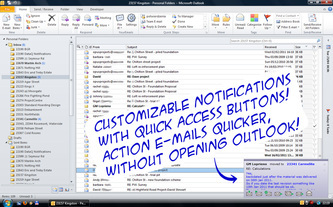 It also includes other features to make you even more efficient with your e-mails, like customizable 'new message' notification with handy quick action buttons. 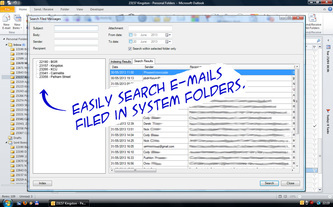 You will be amazed how quick and easy it is to sort, file and search e-mails with YourEmails. 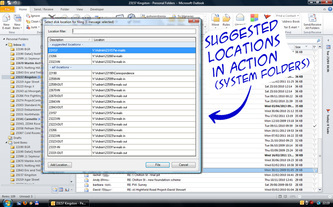 NOTE 1: if you installed YourEmails through 'Run as... 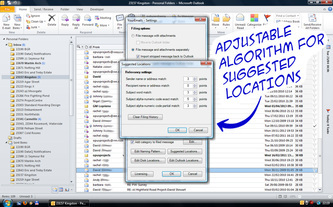 Administrator' command then you will have to log out and log in again for the add-in to work. 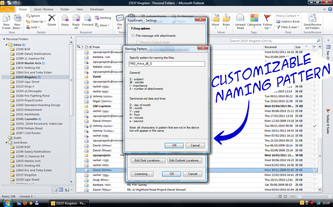 NOTE 2: if you do not have admin rights then for auto sorting to work your administrator must give you permission to modify Program Files/YourEmails folder. 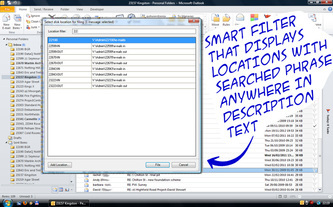 To learn how to install, use, activate a full version, or in case of any problems go to this help file. 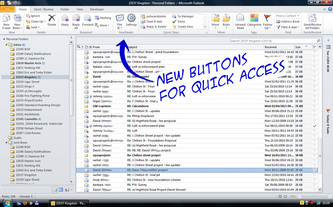 Cost of a single user license starts from only £16 when bought in bulk. 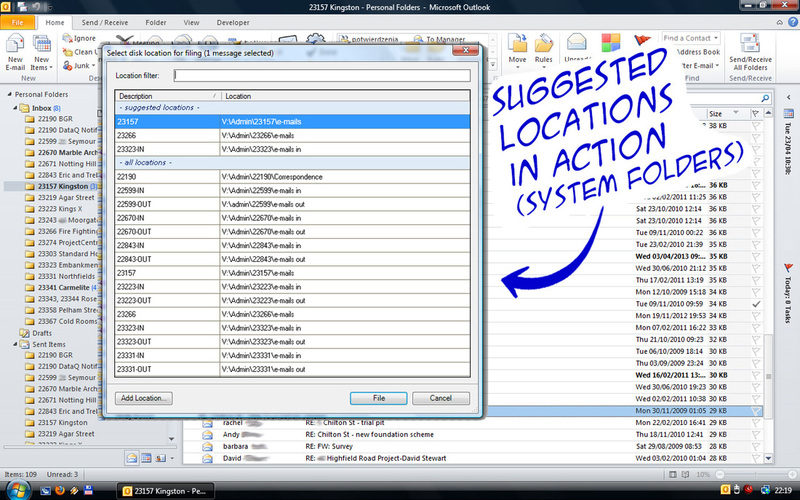 After purchase fill in this Activation Request Form.